Each January I visit New York for conference. Although I’m officially there for business, I never can seem to turn off my artist’s eye. I’ve put sketches up here before which I’ve done in museums, hotel rooms, night clubs. Even just leaning against a wall in Times Square late at night. Always interesting to me. Most do not turn into finished artwork but are just memory notes. This happens to be a painting that I did based on the view from my hotel room. I love the early morning light dancing across the buildings with the cool colors of Central Park in the background. There seemed to be some inversion layer going on which translated into a variety of impressionist colors. 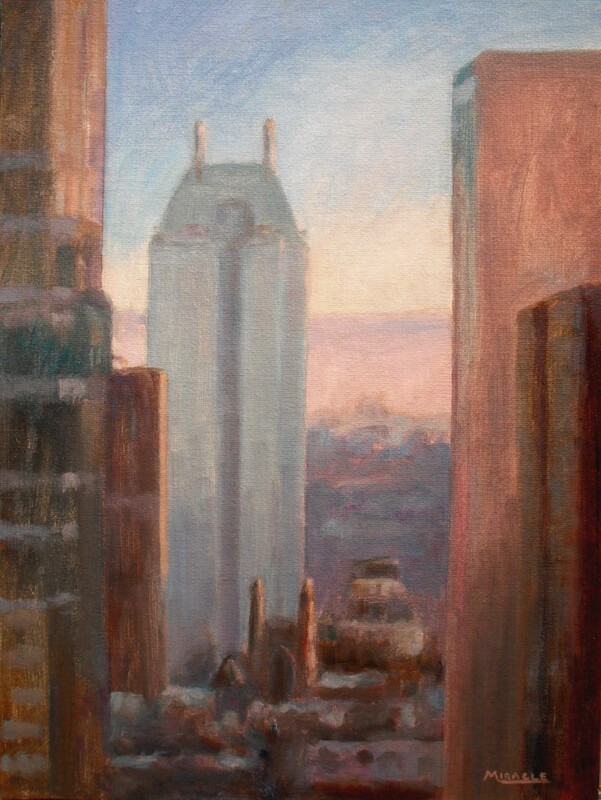 When I create a painting like this, I’m often asked why I didn’t finish off the buildings. But that wasn’t what attracted me to the scene, I reply. It was the juxtaposition of hard and soft shapes, early morning light, a light dusting of snow on the roof tops. I doubt the painting would have been improved if I had included every window, balcony, and detail. This just leaves the soft feeling of a city wakening to a new morning. What do you think? This entry was posted in art, oil painting, Uncategorized and tagged art, central park, contemporary impressionist, january, kit miracle, new york, oil painting. Bookmark the permalink.